I've discovered a few great mattifying products over the years, but Rimmel Stay Matte Primer is one of the most impressive - and it's a drugstore brand that won't break the bank. Rimmel Stay Matte Primer is so good, you'll want to have a second (or third) for back up and travel. When you want to create a matte base for makeup in sweltering summer months, as well as prolonging the color and texture of your makeup during the day, Rimmel Stay Matte Primer is a must have. The texture was slightly surprising. Rimmel Stay Matte Primer felt think and almost like a glue coming out of the tube, but as soon as I applied it to my skin, it had a perfect amount of "slip" and glided across my face. It was actually lightweight and absorbed into my skin immediately, leaving a soft, healthy finish that was matte, but not chalky or dull looking. Since I'm primarily oily on my t zone, but almost every where in humid weather, I really put Rimmel Stay Matte Primer to the test. I used it under matte finish foundations as well, like Maybelline Fit Me Matte and Poreless or NARS Velvet Matte Skin Tint Broad Spectrum SPF 30. Rimmel Stay Matte Primer claims to control shine for up to 8 hours, and it did exactly that. It worked well with my makeup and I could tell by late morning (when I would normally either have faded foundation or lots of oil breakthrough), my shine was reduced by more than half, meaning I only needed to lightly blot (I liked using Murad MattEffect Blotting Perfector for on the go touch ups). By the end of the day, I would only need to blot once more, and that was usually on extremely hot (over 30c / 90F) and humid days. 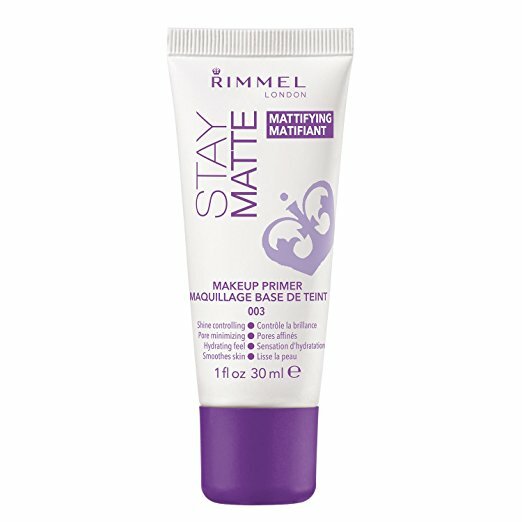 Purchase Here: Rimmel Stay Matte Primer, 1 Fluid Ounce Also available at drugstores nationwide. *This product was provided courtesy of Rimmel PR for reviewing purposes.